From left to right, Ryan Arledge and Nate Horton were presented the Eagle Scout Rank, the highest award in the BSA, at a ceremony held at the First Presbyterian Church. Ryan Arledge and Nate Horton have advanced to the highest rank in the Boy Scouts of America program and have earned the Eagle Scout award, becoming the 43rd and 44th Eagle Scouts of Troop 112 of Washington C.H. The Eagle Scout rank requires a number of accomplishments, including a minimum of 21 merit badges, holding of leadership positions within the troop, and completion of a large-scale project that benefits the community. In addition, both Ryan and Nate are members of the Order of the Arrow, a national fraternity within Scouting representing the best of Scout spirit, trustworthiness and cheerful service to others. Arledge’s Eagle project was to refurbish the Perry Township Hall in New Martinsburg. Renovations included modernizing the kitchen of the town hall, painting and cleaning various areas of the building, which is used for community events and gatherings in addition to its role as the meeting site of the township trustees. Horton’s project included the design and construction of a gazebo/picnic shelter at the Shaw Wetlands. Bikers along the Tri-County Triangle Trail also use the area and will welcome the sheltered location for a meal or rest breaks. Both projects involved planning, raising funds to pay for materials, and organizing fellow Scouts and adults to complete the work of the project. Both projects required several weekends of work by scouts and adults. Nate and Ryan were honored during a recent ceremony held at the First Presbyterian Church, which sponsors the Troop. During the afternoon service attended by family and friends, scoutmaster John Pickelheimer spoke about the values of scouting and how these two boys had advanced through the ranks of scouting with honor and have always given their best. Troop committee chairman Dan Bishop conducted the service honoring the scouts and their parents for their support. The mother of each boy pinned the Eagle award on her son, and both scouts presented recognition pins to their parents, Ibby and Kevin Arledge, and Tracey Horton. Ryan and Nate spoke about their projects and thanked their fellow scouts and members of the community for their help with their Eagle projects. Persinger Hall was the site of a meal after the ceremony honoring the new Eagle Scouts. On display were awards and mementos from each boy’s trail to Eagle. Troop 112 is proud to call Ryan and Nate their latest Eagles. Their names will be added to the 42 other Eagle Scout members who have earned the award over the years with this troop. 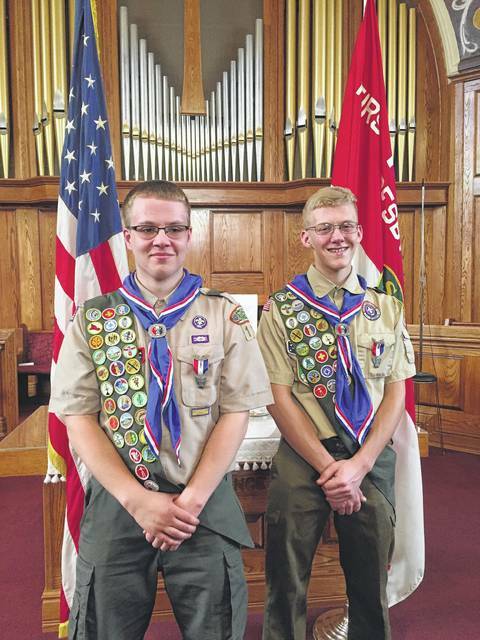 https://www.recordherald.com/wp-content/uploads/sites/27/2017/07/web1_IMG_8667.jpgFrom left to right, Ryan Arledge and Nate Horton were presented the Eagle Scout Rank, the highest award in the BSA, at a ceremony held at the First Presbyterian Church.